Well we have moved on to a new country! 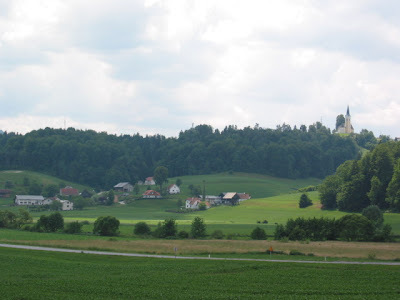 On Sunday we left Hévís behind and headed south to Lenti, which is near the south western border with Slovenia. 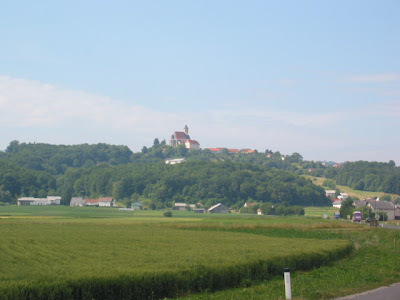 Yesterday morning we crossed the border into Slovenia and headed for Ptuj. This is a lovely town on the River Drava. We are back to riding on roads again (rather than cycles paths) which is faster, but always has more risks! Slovenia feels very different to Hungary, it is a bit more affluent which is evidenced in the look of the houses, car and towns. The country side is very green and rolling - we are getting some hill workouts now on the bike. 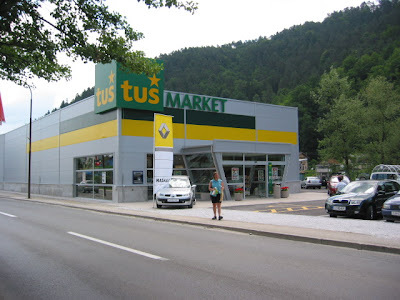 We are staying in a camp ground attached to the Ptuj Termal Spa. So we have been soothing our weary bodies with hot pools and saunas. 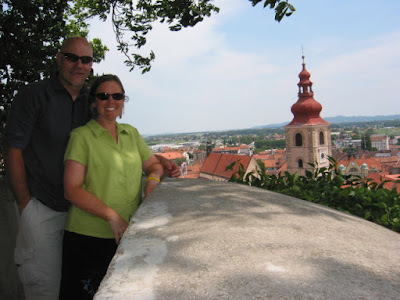 Have got lots of cool photos which we will put up when we get to Ljubljana (in a few days time). The second view is of a church that we cycled up to but we can't remember the name of it at the present time - it was noted on the map as a church of signifance too!! The third photo is us trying to capture the lovely countryside that we cycled through but it is hard to do the country justice with a photo . . . . The last one is of Sandy coming out with our typical daily lunch - baguette, ham, cheese etc, drink and maybe some other treat . . . . . .